Let's Go On! 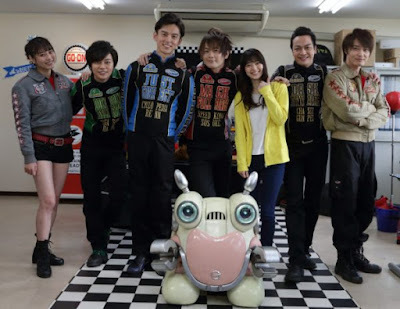 After 10 years, those checkered flag racers are back for more action packed adventures in the latest V-Cinema Super Sentai presentation: Enjin Sentai Go-onger 10 Years Grand Prix! It is confirmed that the seven main cast will return to reprise their roles in this movie that is written by Katsuya Watanabe, who worked for the series back in 2008. Enjin Sentai Go-onger 10 Years Grand Prix will be released on Blu-ray and DVD this September 26, 2018. That's great News. Hope other shows get their 10 years reunion movies. They don’t have to use him but is anyone else hoping they at least mentions Engine Machalcon from Gokaiger. You what this means? We're not too far off from a "Gokaiger: 10 Years After" movie, if one happens at all.